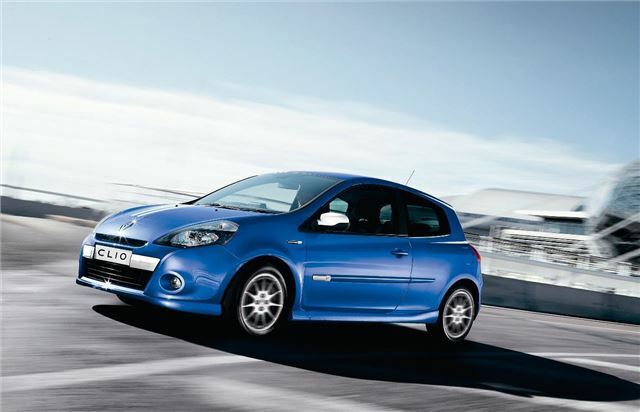 The success of Renault’s Gordini specials has spurred the firm on to expand the range of Clio Gordini models. Priced from £14,000 the new Clio Gordini line-up allows customers to enjoy the look and feel of the 200bhp Renaultsport Gordini Clio but with low fuel consumption and running costs, thanks to the lower power, more efficient 1.6 VVT and 1.6 dCi engines. The 1.6 VVT petrol engine provides brisk performance, with 0-62 taking 9.3 seconds, but with reasonable fuel consumption of 42.2mpg. There’s also a 106bhp 1.5-litre dCi diesel which costs £14,950 and is capable of 62.8mpg, with low CO2 emissions of 110g/km. Both variants get all of the Gordini trimmings, including white racing stripes, 16-inch alloy wheels, white electric folding door mirrors, twin exhausts, tinted windows, extra colour coding, and Gordini badges. Grey cloth with a Gordini logo trims the interior, with leather as an option. There are also various Gordini trim enhancements, including a leather trimmed steering wheel with Gordini white stripe and gloss black details. Standard equipment includes four speak audio, AUX-in, automatic lights and wipers, climate control, cruise control and a speed limiter. Orders are open now.